If you struggle with addiction or have suffered a relapse, you aren’t alone. Treating drug abuse is complex. The best rehab approaches provide adequate support and are tailored to your individual needs. An inpatient rehab program that utilizes evidence-based treatment methods and helps people transition to step-down continued care may be the most effective for those with severe addictions. Inpatient rehab centers provide accommodation for residents while they’re working through recovery. The length of time a patient stays at an inpatient facility varies depending on addiction severity, substance of choice, and other physical and emotional aspects. Residential rehabilitation may begin with detox. Some drugs take longer than others to leave the body. For example, withdrawal from certain substances, such as alcohol, can be dangerous if it’s not medically supervised. 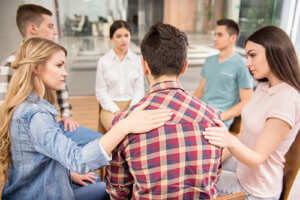 Fortunately, at 1st Step Behavioral Health, we offer on-site detox so you can become familiar with our facility as you take the first courageous step to recovery. After detox, you’ll stay in our inpatient drug and alcohol treatment program while receiving 24-hour care in a safe, supportive environment. When you enter treatment, you’ll work with a counselor to create a custom program that’s the most effective for your unique needs. As you work toward recovery, we’ll continually evaluate your progress and adapt your plan to provide maximum benefits. Your primary counselor is your go-to recovery advocate who will work closely with you to monitor your care. While most residential rehab facilities offer treatment lasting anywhere from a week to 90 days, 1st Step Behavioral Health provides a long-term continuum of care. Many of our clients stay with us for up to a year to help ensure successful sobriety. Although some people recover after one round of intensive treatment, many require multiple therapeutic levels as they transition back into daily life. However, this is not an indication of your willpower or strength. Most people struggling with addiction need maintenance therapy for the rest of their lives. An inpatient rehabilitation program is ideal for people with severe addictions. Perhaps you have trouble going a few hours without experiencing drug cravings. Therefore, if you have a strong compulsion to use, you might benefit from the 24-hour care you’ll receive in an inpatient program. Maybe you’ve tried a less intense form of treatment before and relapsed. Thus, you might need more intensive therapy to get you on the right path. Substance abuse and withdrawal can lead to health complications. For example, some people are a danger to themselves or others when using drugs or trying to quit. These individuals usually do well in inpatient programs. Many individuals suffer from a mental health condition in addition to an addiction disorder. Thus, patients with a dual diagnosis may find the intensive care at a residential facility helpful. Changing your life involves modifying your thoughts, actions, lifestyle, behavior, and coping mechanisms. You are instrumental in achieving your own success. Therefore, at 1st Step Behavioral Health in Pompano Beach, Florida we give you the necessary support to be confident in your power to heal. Don’t be afraid to treat yourself as well as you deserve. Call us at 866-319-6126 today to explore whether inpatient rehabilitation is right for you.